22" x 20" engine, A. Delle, St. Catharines, ONT. 1872, Mar 1 Owned Fred W. Williams, Toronto, ONT. 1877, Aug 22 87 gross tons. 1878 Owned George Moberly, Collingwood, ONT. 1882 Owned George Moberly & Co., Dunnville. 1882, Sep 5 Wrecked, Tobermory, ONT, 2 lives lost. 1884, Nov 4 Owned George Nobuly, Collingwood, ONT. 1884 97 ton wrecking tug, owned G. Moberly, Dunnville & Collingwood. 1889, Mar 6 Owned Thomas Marks, Port Arthur, ONT. 1890 Owned Thomas Marks & Co., Port Arthur "new" steeple compound engine, 16", 18" x 22" Doty Engine Works, Goderich, ONT; new scotch boiler Johninglis Works, Toronto, ONT. 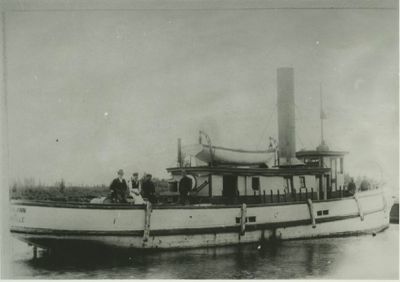 1894, Apr 7 Owned Lake Superior Tug Co., Port Arthur. 1901 Dismantled, Collingwood, made a 57 ton barge; machinery transfered to new tug LAURA GRACE C107171. 1902-20 Owned Pigeon River Lumber Co., Port Arthur; may have been abandoned after 1920.